Since the one-time 10 July 2013 appearance of Black Skimmers at Conservatory Water (aka, the model boat pond), I have wanted to add these birds to my Central Park list. I had already looked for them in New York Harbor and on Governors Island in June and July 2012 after Andrew Farnsworth had one on the East River, as I mentioned in my book. As then, at least ten turn up regularly in the sheltered bays surrounding Liberty State Park. You would think that observers on the southwest shore of Manhattan and on Governors Island would see them frequently, but this is not the case — such sightings have been rare. I had observed the Black Skimmer in Manhattan once before, in October 2012 in the wake of Hurricane Sandy on the Hudson River, but it was a very distant and unsatisfying view. 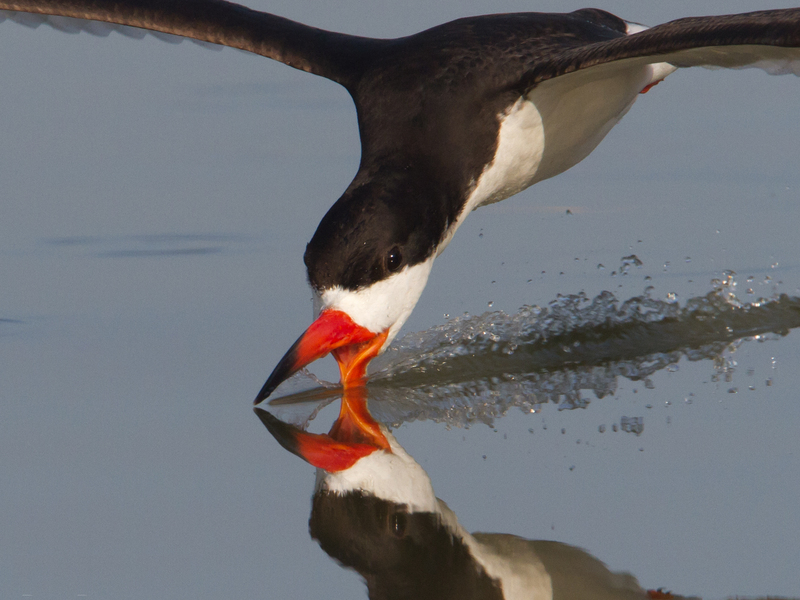 There was a single report of two Black Skimmers feeding over Turtle Pond in late July 2014, the only known occurrence of them in Central Park that year. These birds used to be seen regularly on Turtle Pond after sundown in June and July of 2003 and 2006. Now one must be a great deal more fortunate in order to see them. Last Friday, 19 June 2015, one was observed on the Meer at 8:50 p.m. and reported on eBird the following day. Naturally I visited the Meer that evening despite a light mist and occasional drizzle, but I did not see a skimmer. I wanted to try again when conditions were more favorable. This means mostly clear skies (so the birds are not discouraged from flying several miles to Central Park from their breeding grounds at Breezy Point or elsewhere) and relatively calm winds. Skimmers require calm water for feeding, which is why they prefer small, sheltered bodies of water like Turtle Pond or Conservatory Water). Yesterday, 22 June, the conditions seemed right, so I ran to the Meer, arriving at 8:37 p.m. just as the sun was setting. I soon saw a large bird with dark wings and a long bill flying over the water, but it turned out to be a Black-crowned Night-Heron. Otherwise, not much was going on. A few Chimney Swifts chattered overhead. I was positioned at the extreme western tip of the Meer, midway between the north and south shores. At 9:02 a Black Skimmer appeared over the southwest corner of the Meer and began skimming. The lights by the skating rink along with the natural twilight allowed me an excellent, close view of the skimmer as it slowly fished the water surface. The bird was unmistakable both in appearance and behavior, clearly different from any other that one sees in Central Park. After observing several brief passes over the water, I took out my cell phone and started to enter a #birdcp text alert. By the time I had finished typing the alert I could no longer see the skimmer. I searched the rest of the Meer (mostly algae-filled but worth a look) but I was unable to re-find the bird. After ten minutes I moved on. Perhaps the Meer did not suit the skimmer’s taste; maybe the skimmer was just giving it a quick try while in transit to or from some other more desirable place. At any rate, finally seeing it in Central Park was quite a thrill.